Pre Workouts Without Creatine (2018) – Which Are the Best? Creatine is one of the safest and most effective training supplements - but that doesn't mean everyone wants it in their pre-workouts. Dose Control. If you want complete control over when and how much creatine you take, buying a separate powder makes sense. Water Retention. Creatine can cause weight gain due to excess water, which is frustrating if you're aiming for a lean and toned physique. Caffeine and Creatine Interaction. There is some evidence that suggests caffeine may reduce the effects of creatine. This isn't proven yet, but if you're worried about it you may want to take creatine separately. Are These Mixes Just as Good? Fortunately, there are some excellent creatine free pre workout supplements on the market. These provide a similar boost to strength, energy, endurance and recovery, so you don't need to feel you're missing out. It's important to choose the right pre-workout though. While the best products can have a significant effect on your workout, the worst options are over-priced, under-dosed and just not worth the trouble. To help you make the right decision, we've researched the best products and listed them below. Each provides a fast performance boost, so you can maximise your workout and reach your goals faster. Note: This page is only for pre-workouts that don't contain creatine. For our ultimate list of the best PWOs, click here. Listed below are five of the best no creatine pre workout supplements. Whether you want to take creatine separately, so you have more control over the dose, or want to avoid extra water retention, these supplements are great for boosting your workout performance. If you're looking for the most powerful preworkout with no creatine, PreSeries BULK is our top recommendation. It's an exciting preworkout with no proprietary mixes and a formula that screams "lean muscle mass." It also contains no artificial colorings, sweeteners or preservatives. Note: Transparent Labs also produce the excellent PreSeries LEAN for cutting. See further down this list for more information. BULK has an impressive ingredients list. While we usually recommend avoiding pre-workouts with long labels (BULK has 19 active ingredients), this is one of the few that combines lots of ingredients with proper doses - at least for the vital ingredients. Citrulline Malate (6000mg). Citrulline has been shown to increase muscle endurance, strength and aerobic performance. BULK contains 6mg, which should be enough to get the full benefit of this supplement. Beta-Alanine (4000mg). Beta Alanine helps reduce fatigue while increasing anaerobic capacity. This means it indirectly helps to increase lean muscle mass. The 4g of Beta-Alanine per serving in BULK is plenty for a fast boost to your workout. Betaine (2500mg). Betaine helps increase strength while enhancing endurance. The clinically effective dose is 1.25-2.5 grams, so BULK has a generous amount per serving to provide full benefit. Caffeine & L-Theanine (180mg & 360mg). Caffeine and L-Theanine, when combined, provide a rapid boost to focus without the jitters of caffeine on its own. We think 150-200mg of caffeine is the sweet spot, so BULK is right within our desired range. Other Ingredients. 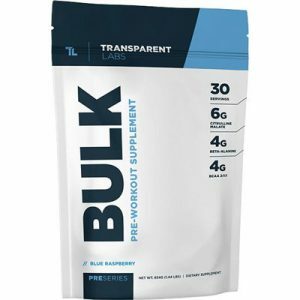 As we mentioned, BULK contains a range of other ingredients, including Taurine, BCAAs, Choline Bitartrate, Synephrine and a testosterone support complex. 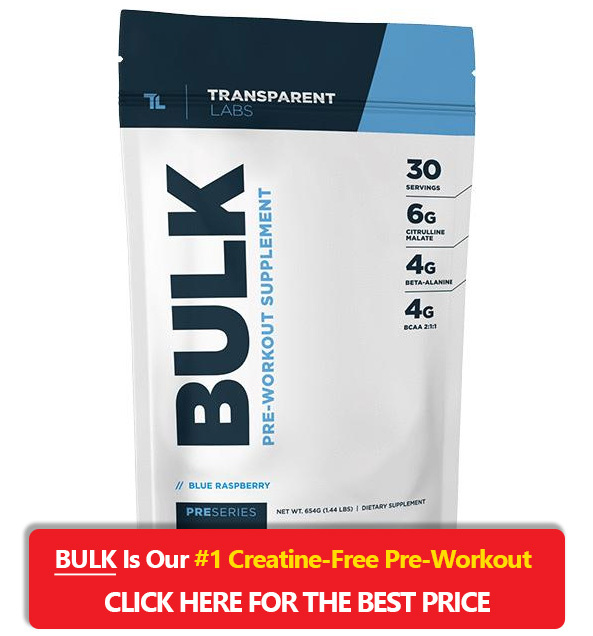 Summary: If you're looking for a no-creatine pre-workout that can boost strength, lean muscle mass and endurance, PreSeries BULK is our top recommendation. It contains a huge ingredient list with clinically-backed doses - plus it doesn't contain unnecessary fillers or artificial sweeteners. We highly recommend it (although women may need an alternative without the testosterone boosting complex). Staunch Pre Original is a great all-rounder for getting a serious pump, boosting energy and increasing focus - all without creatine. Like PreSeries BULK, it has a transparent ingredients list that's backed by scientific doses. It's also available in two flavors: peach mango and blue berry. Staunch contains fewer active ingredients than PreSeries BULK, and many have lower doses. Most of the important ingredients are at proper doses though, so you get a great performance boost for your money. Citrulline Malate (6000mg). Like PreSeries BULK, Staunch Pre Original has an impressive 6g of Citrulline for increased strength and endurance. Betaine (2000mg). While the Betaine per-serving is slightly lower than BULK, 2000mg is still enough to benefit from this important pre-workout ingredient. Caffeine & L-Theanine (180mg & 180mg). We like that Pre Original has a caffeine/L-Theanine stack - although we would have preferred a 1:2 ratio instead of 1:1. Even so, this stack will rapidly increase your energy and alertness without causing jitters. Tyrosine and hordenine are also included in the energy/focus complex. Other Ingredients. Along with those above, Staunch also includes vitamin B12, Arginine, Beta Alanine and Agmatine. One of the only complaints we have about Staunch is the 1600mg of Beta-Alanine. This is much lower than PreSeries BULK and may be too low to get the full benefit. Great all-round ingredient list for a combination of pump, focus and strength. 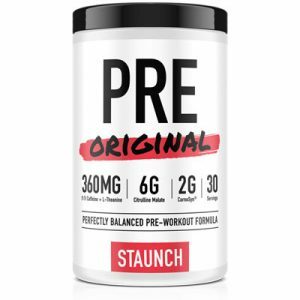 Summary: If you're looking for a solid pre-workout without creatine - and aren't worried about artificial ingredients - Staunch Pre Original is an excellent choice. The under-dosed beta alanine and smaller L-Theanine dose mean it's not quite on the same level as PreSeries BULK though. For a more "stripped back" pre-workout that focuses mainly on energy, Animal Fury is an excellent "no creatine" product. 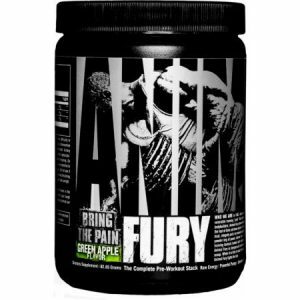 Animal Fury features a non-proprietary label that includes generous doses of Citrulline and BCAAs. It also has ​a huge 350mg of caffeine, which isn't for the faint hearted! In other words, this pre workout without creatine is mainly for serious weightlifters or bodybuilders, although the simple ingredients list means it can boost the energy, performance and focus of almost any athlete. Citrulline (6000mg). Like #1 and #2 on this list, Animal Fury has 6g of Citrulline for improved strength, pump and endurance. This is a clinically backed dose to get the full benefits of Citrulline. BCAAs (5000mg). BCAAs might be over-hyped, but they can prevent muscle breakdown (especially during a fasted workout). While 10g of BCAAs is probably required for full benefit, the 5g included per serving in Animal Fury is enough to get some benefit. Beta Alanine (2000mg). While Beta Alanine is great for reducing fatigue, the 2000mg per serving in Animal Fury may not be enough to get the full benefit. L-Tyrosine (1000mg). L-Tyrosine is an amino acid that assists in the production of dopamine and noradrenaline. It's been shown to improve mood and relieve stress, so it's a useful ingredient for tough workouts. Caffeine (350mg). Animal Fury contains a LOT of caffeine. For this reason, it gives a rapid and large energy boost, but be prepared for a crash after your workout. For the most grueling sessions, however, this hit of caffeine can give you a jolt of motivation. One thing to note about Animal Fury is that it contains artificial flavors and sweeteners. If you want to avoid artificial products, go for the PreSeries BULK instead. Summary: If you're looking for a "no nonsense" pre workout for serious weight lifting - especially if you want a big stimulant boost - Animal Fury is one to consider. The large dose of caffeine means it isn't the right choice for everyone though. We've already included PreSeries BULK on this list, but if you're looking for a creatine-free preworkout for cutting (or without testosterone boosting ingredients) then LEAN is the better option. LEAN contains many of the same ingredients of BULK - plus a few extras (it has 21 active ingredients). The goal of this pre-workout is to help you build (or maintain) lean muscle mass while targeting stubborn fat. Citrulline Malate (6000mg). Like the first three pre-workouts on this list, LEAN includes 6g of Citrulline to provide the full endurance, strength and aerobic benefits. Betaine (2500mg). LEAN contains the same dose of Betaine as BULK, which helps reduce fatigue and trigger lean muscle growth. Beta-Alanine (1500mg). One of the differences between LEAN and BULK is that the cutting supplement contains significantly less beta alanine. While it still provides some benefit and can prevent fatigue, the dose may be too small for the full effect. Caffeine & L-Theanine (180mg & 360mg). Caffeine and L-Theanine are included in a 1:2 ratio. This combination can boost focus and energy without the jittery side effects associated with caffeine. Fat Burning and Thyroid Support Complex. LEAN includes ingredients such as zinc, iodine, selenium, guggulsterones and copper to help target stubborn fat. Other Ingredients. 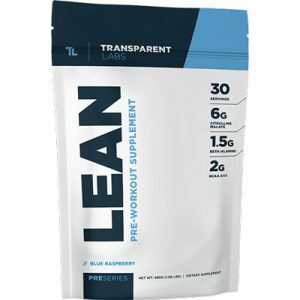 LEAN contains a range of other ingredients, including Bioperine, Choline Bitartrate and L-Tyrosine. Synephrine is also included, which can increase resting metabolic rate to help burn more fat. Like PreSeries BULK, LEAN doesn't contain any artificial preservatives, colorings or sweeteners. It's also gluten-free and doesn't have GMO ingredients. 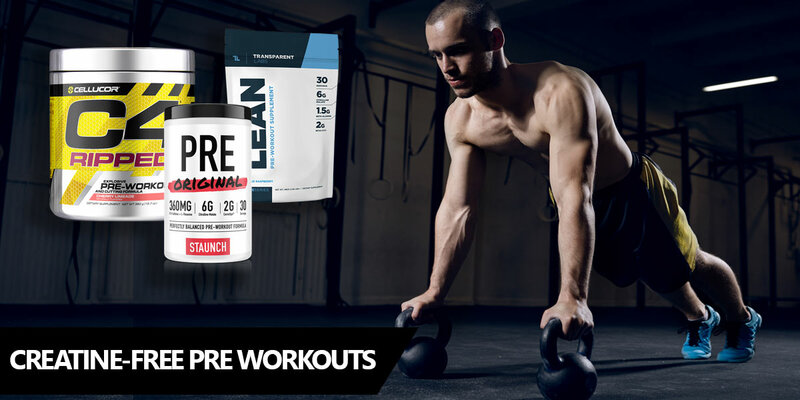 Summary: If you're looking for a "no creatine" pre workout for cutting or targeting stubborn fat, the PreSeries LEAN is our top recommendation. The combination of fat burning, thyroid support and lean muscle building ingredients mean it's an excellent supplement. Another excellent pre workout without creatine is SciVation Quake 10.0. It's an impressive supplement with a large dose of BCAAs, strong pump complex and a huge hit of caffeine. So who should buy it? If you want a massive boost from caffeine but don't feel "Animal Fury" is well-rounded enough, Quake 10.0 is a great alternative. It's also good for fasted workouts, due to the large amounts of BCAAs (including 3500mg of L-Leucine). It doesn't come with Betaine or Beta-Alanine though. This means we don't think it's as effective at reducing fatigue or triggering lean muscle growth. Additional Note: There is a caffeine-free version of this pre-workout. If the 350mg is too harsh, it's a good alternative. Quake 10.0 has a strong pump complex and uses clinically backed doses for Citrulline. We don't like that the "PeakO2 Blend" is proprietary though, which is one of the main reasons it's only #5 on this list. L-Citrulline (6000mg). As with all the pre-workouts on this list, Quake comes with the full 6mg of clinically-recommended Citrulline. Caffeine + L-Theanine (350mg & 200mg). If you're looking for a pre-workout without creatine or caffeine, the base version of Quake 10.0 is clearly not the one to go for. With 350mg of caffeine, it'll rapidly boost energy and focus levels - and the L-Theanine helps to smooth the effects. The drawback is the 200mg of L-Theanine isn't enough to fully balance the large dose of caffeine. There IS a caffeine-free version though - but it won't provide the same stimulatory effects. Tyrosine (3000mg). For intense workouts, Tyrosine can help you get through by reducing stress. Like most pre-workouts, Quake 10.0 uses artificial sweeteners and flavors. If you want a natural pre-workout, take a look at the PreSeries products instead. 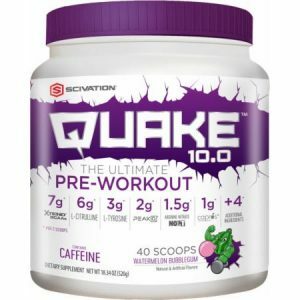 Summary: Quake 10.0 has a decent pump matrix and generous dose of BCAAs. Without Betaine or Beta-Alanine it can't match the all-round performance boost of the others on this list though. Preworkouts without creatine can still increase power, energy, focus and endurance. They obviously won't provide the benefits of creatine, but in every other way they can be just as effective. To put this another way, "synergy" between ingredients in pre-workouts is often vastly overrated. If creatine isn't included, you lose the benefits of that particular supplement, but it probably won't make the other ingredients less effective. Let's take a step back though. Creatine is one of the few supplements that has been directly proven to increase muscle growth. 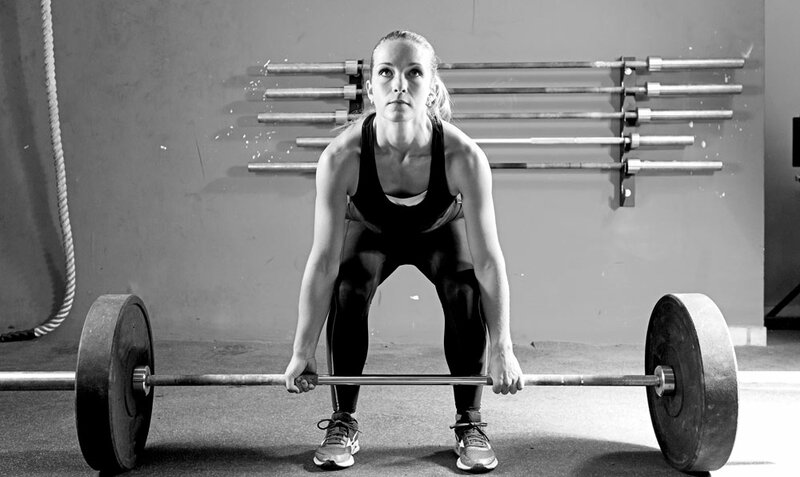 Studies have shown that it can improve your strength, reduce post-workout soreness and increase endurance. With that in mind, why would you not want it in a pre-workout? There are actually a few reasons. Firstly, some people prefer to take creatine separately. This allows you to control the dose without worrying about over or under dosing other ingredients. You can also take it after a workout, as this may be more effective (although taking before and after is probably best). There is also some evidence that suggests taking creatine at the same time as caffeine may reduce its effect. This is far from proven. But as it's easy to take creatine separately, some people don't want to take the risk. You also may not want to take creatine if you're worried about water retention. While creatine is a safe supplement, it can cause you to gain wait due to extra water. High doses, for example, can cause weight gain of over 5 pounds. When you combine these reasons, it's clear why some people prefer to avoid creatine in their pre-workout. Using a creatine-free preworkout drink or capsule doesn't need to compromise your performance. Some of the best pre-workouts don't include creatine, yet still boost endurance, strength, lean muscle growth and focus. Our top pick for a creatine-free PWO is the excellent PreSeries BULK. It's a well-rounded supplement with clinically-backed doses and provides a jitter-free performance boost. If you don't want the testosterone-boosting ingredients, Staunch Pre Original or PreSeries LEAN are great alternatives. We hope this article has helped you choose the best creatine free pre workout. If you have any questions, or want to recommend a supplement, let us know in the comments section.